American F-16 Falcons and A-10 Thunderbolt IIs of the 51st FW fly over Osan Air Base in June 2009. 烏山空軍基地), is a United States Air Force facility located near Songtan Station in the city of Pyeongtaek, South Korea, 64 km (40 mi) south of Seoul. Despite its name, Osan AB is not within Osan City, which is 7.5 km (4.7 mi) to the north. The base is the home of the Pacific Air Forces' 51st Fighter Wing, and a number of tenant units, including the headquarters for Seventh Air Force. The base is also the headquarters of the ROK Air Force Operations Command. Osan Air Base is also the departure and arrival point for U.S. government-contracted "Patriot Express" flights bringing servicemembers and their family members to South Korea from Seattle Airport in the U.S. state of Washington, Misawa Air Base and Yokota Air Base in Japan. As the most forward deployed permanently based wing in the Air Force, and equipped with A-10 Thunderbolt IIs and F-16 Fighting Falcons, the 51st Fighter Wing is charged with executing combat operations, receiving follow-on forces and defending the base from attack. As the air component to U.S. Forces Korea and Combined Forces Command, 7th Air Force provides the command and control structures and personnel necessary to deliver precise, persistent, combined air and space power in defense of the Republic of Korea. Osan Air Base is one of two major U.S. Air Force installations operated by United States Force Korea, the other being Kunsan Air Base. Osan Air Base is one of two major airfields operated by the U.S. Air Force in the Republic of Korea and the only base on the peninsula entirely planned and built from scratch by Aviation Engineers (SCARWAF) units attached to the U.S. Air Force during the Korean War. Osan AB also was the site of the "Battle of Bayonet Hill" on 7 February 1951, on and around Hill 180 where the Air Component Command's Hardened Theater Air Control Center (HTACC) and the headquarters of the 51st Fighter Wing are currently located. The battle took place during the U.S. Eighth Army's Operation Thunderbolt. Captain Lewis Millet led a bayonet charge of his soldiers of Company E, 27th Infantry Regiment, 25th Infantry Division up the hill against an unknown number of Chinese Communist Forces (CCF) ensconced on its crest. "Easy" Company routed the CCF, and Captain Millett received the Medal of Honor. Subsequent to the battle, the CCF were driven back north of the 38th parallel, and resulted in the return of Fifth Air Force tactical fighter units to peninsula. Aviation engineers, meanwhile, surveyed locations in the ROK to build an air base capable of supporting jet fighters. They decided upon the area southwest of Osan-Ni. Established in November 1951, the base originally was named Osan-Ni AB (and still referred to by its "K-55" airfield designation from the Korean War). The name "Osan-Ni" was chosen for practical reasons – it was the only village shown on most military maps of the time, and it was easy to pronounce. The 839th Aviation Engineer Battalion began construction of base support facilities and infrastructure early in 1952. On July 9, 1952, the 839th, joined by the 840th and 841st Engineer battalions (Reserve engineer units called up for active duty, the 840th from Tennessee and the 841st from Florida), started work to lay the airfield's runway, taxiway and parking ramps. (These units were under the 934th Engineer Aviation Group, which was under the 417th Engineer Aviation Brigade, which was under the 5th Air Force). Monsoon rains, though, impeded initial efforts to fill the rice paddies and begin airfield construction. The delay forced engineers to work 24 hours a day, seven days a week beginning in August. Three engineer aviation battalions were assigned the task of building Osan; the 839th, 840th, and 841st EABs. They completed laying a 9,000-foot, 8-inch-thick (200 mm) concrete runway in 2½ months. With the taxiway also completed, and parking ramps nearing completion, the 18th Fighter-Bomber Wing and one of its F-51 combat squadrons arrived on December 26, 1952. 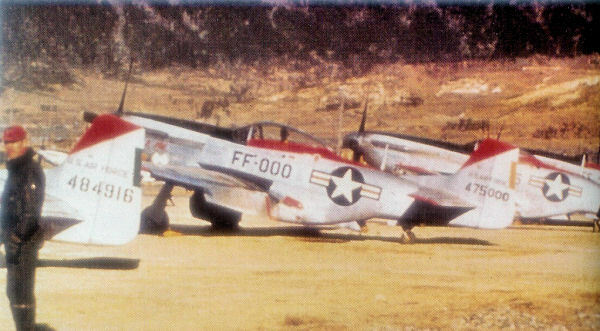 With the wing's other two squadrons arriving shortly thereafter, the wing converted to the F-86F. With the Armistice Agreement signed on July 27, 1953, the 18th FBW remained at Osan-Ni AB for defensive purposes until November 1954. Meanwhile, plans called for HQ Fifth Air Force (Advance) to move from Seoul National University to Yongsan Garrison in Seoul. This plan was changed, and in January 1954, the headquarters relocated to Osan-Ni AB, and established the base as the major hub of operations for U.S. air power in the ROK. As the Armistice took hold, the U.S. Air Force redeployed all but one tactical fighter wing from the peninsula, and in November 1954, after Fifth Air Force relocated to Tokyo, the 314th Air Division replaced its former advanced headquarters at Osan-Ni AB. The 58th Fighter-Bomber Wing moved from Taegu AB to Osan-Ni AB in March 1955, and became the only permanently assigned tactical fighter wing on the peninsula. On September 18, 1956, the base was redesignated Osan AB, its current name. Concurrently, Fifth Air Force complemented this strategy by instituting rotational deployments of fighter aircraft units to Osan and Kunsan ABs from its Far East bases and the U.S. to bolster the defense of the Republic of Korea as it steadily trained and equipped the ROK Air Force. Although the Matador missiles were relocated in 1962, fighter deployments continued throughout the 1960s. Other than a major reconstruction of the runway in 1959, the base still retained its Korean War-vintage facilities and infrastructure. There was no money spent on improving the facilities. Besides the new focus was on Cuba with the Missile Crisis and Europe in the new Cold War flare up. Korea was forgotten. On base the barracks were still the corrugated iron barracks of the Korean War and the base simply stagnated with the 6314th Air Base Wing in charge of not only Osan, but also Kunsan as well.This condition changed modestly beginning in 1968. Starting in September 1964, Osan AB was home to the Military Air Transport Service (MATS), 36th Air Rescue Service (ARS), Detachment 4. The unit flew the HH-43B Huskie which was dubbed "Pedro." Two HH-43B Pedros were assigned to Osan AB – aircraft 60-251 and 60-252 as of September 64. Assigned under the Air Rescue Service (ARS) based in the Pacific Air Force (PACAF) region. The MATS, 36th ARS, Det 4 became Provisional Air Rescue Component (PARC), Det 9 on 25 July 1965 and remained with this designator until 8 January 1966. The North Korean attack on the USS Pueblo and seizure of its crew on January 23, 1968, precipitated deployment of 1,000 Air Force personnel, on temporary duty status, to Osan AB in support of operation 'Palace Dog III'. Airmen stationed at bases in the US, and Asia (including Vietnam) began arriving on January 25, within 48 hours of the attack. Many found that they would have temporary quarters in Korean War vintage tents in below zero weather conditions without cold weather clothing. The developing crisis underscored the importance of the installation at Osan, and led to the infusion of funds for improving existing facilities and the construction of new structures including aircraft shelters and control tower. Security was upgraded in support of the increased tactical operations at the base. From January to March, over 6,500,000 pounds of cargo was shipped by rail to Osan. Conventional munitions transported in converted coal cars, arrived 24 hours a day. The build-up was massive. Although the Pueblo crisis subsided with the crew's release in on December 23, 1968, fighter unit deployments occurred on a regular basis. On April 15, 1969, the North Koreans again triggered a period of tension when it shot down a U.S. Navy EC-121 Warning Star flying in international airspace over the Sea of Japan. 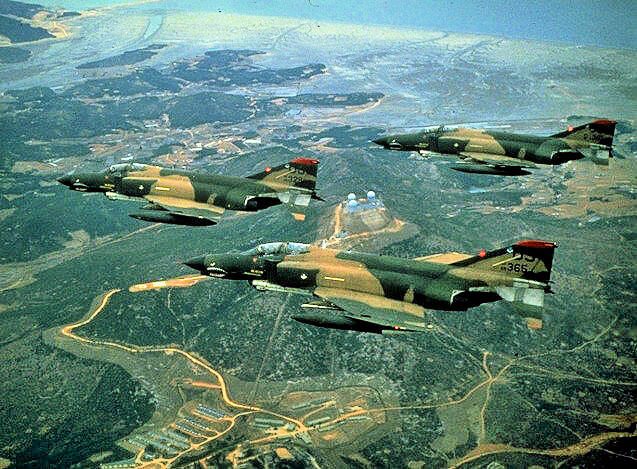 F-106s from the 95th Fighter Interceptor Squadron, 21st Air Division (later 20th Air Division) of Dover AFB, Delaware deployed to Osan AB from 15 November 1969 – 1 May 1970. Attached to Fifth Air Force ADVON, 15 November 1969 – 1 May 1970. The response by the U.S. resulted in another increase of fighter forces on the peninsula, and eventually set the stage for return of permanently assigned fighter units to the ROK. Three 36th Fighter Squadron McDonnell Douglas F-4E-37-MC Phantoms in flight. AF Serial No. 68-0328 and 68-0365 identifiable. At Osan, the major USAF units were 6145th Air Force Advisory Group acting as a training/logistical support unit to the ROKAF; the 314th Air Division; and the 6314th Support Wing. The 611th Military Airlift Command Support Squadron (611th MASS) at Kimpo would later move to Osan. However, as the U.S. withdrew incrementally from South Vietnam and Thailand, Pacific Air Forces repositioned its force structure which led to substantial changes for the U.S. Air Force on the ROK. On March 15, 1971, the 3rd Tactical Fighter Wing was activated at Kunsan AB. At Osan AB, PACAF activated the 51st Air Base Wing to assume host-unit responsibilities at Osan AB on November 1, 1971. Two weeks later, on November 13, 1971, the 3rd TFW's 36th Tactical Fighter Squadron moved to Osan AB. Total withdrawal of U.S. forces from South Vietnam by 1974 resulted in another important change for Osan AB. On September 30, 1974, the 51st ABW was redesignated as the 51st Composite Wing (Tactical), and assigned the 36th TFS with its F-4D/Es and 19th Tactical Air Support Squadron with its OV-10As. With Osan AB serving as the nucleus for more than 20 U.S. Air Force activities on the peninsula, it experienced a period of facility and infrastructure changes during the 1970s. Although many of the Korea-War vintage structures remained, new dormitories were built, and a new headquarters complex completed in 1974 for the 314th AD and 51st CW(T) replaced 71 Quonset huts that were destroyed by fire three years earlier. In 1979 and 1980, construction of on-base family housing and additional community-support facilities gave the base a sign of stability. Establishment of the Combined Forces Command in 1978 further set the future of Osan AB. The evolving role of U.S. Air Force's CFC mission in the ROK led to activation of Headquarters Seventh Air Force on September 8, 1986. It replaced the 314th AD as the U.S. Air Force component command. Construction on Osan AB during the 1980s was dictated largely by mission changes and enhancements, and the threat from North Korea. Introduction of the F-16 in 1988 led to construction of hardened aircraft shelters, a new on-base munitions storage area, and upgrades to unaccompanied personnel housing. The presence of U-2 aircraft was classified until 1978, though the planes could be seen at takeoff and landing. "Black Cat" was the name given to mechanics who worked on U-2's, which were called "Black Birds." The latter nickname may have been transferred to other craft since. While the face of Osan AB slowly changed in replacing its 40-year-old Korean War-vintage structures, the base experienced a lengthy period with little or no military construction program projects. However, other funding sources allowed base officials to add community-type facilities. Arrival of the 25th Fighter Squadron and its A/OA-10s in October 1993 and two Patriot missile batteries in May 1994 also necessitated some new construction. Other than these events, base officials primarily concentrated on improvements in facility protection due to the threat from North Korea's reliance on medium-range SCUD missiles. Annual runway repairs furthermore only attested to the aging of Osan AB as the base witnessed only modest changes in its structural appearance during the 1990s. As the ROK's military grew and matured into a formidable force by the late 1990s, political and military leaders from both countries reexamined the role of U.S. forces based on the peninsula. A major change in U.S. strategic policy coinciding with the "9-11" terrorist attack on the Twin Towers in New York required a "transformation" of global U.S. military commitments and basing. The military had to adapt from a fixed, in-garrison-type force to a mobile, responsive force. For its part, U.S. Forces in Korea studied how technological advances in weaponry could mitigate a reduction in personnel while the ROK military forces carried out an increasing role to protect its sovereignty. The result of this effort led to the landmark agreement known as the Land Partnership Plan in 2002 and the Security Policy Initiative in 2003 between the U.S. and the ROK governments. These decisions reflected a realignment in the roles and missions of USFK that forecast a significant reshaping and growth at Osan AB through 2011. Currently, the 607th Combat Operations Squadron (COS), led by Lt Col Dale R. Addington, has been dissolved. Most U.S. military members assigned to Osan AB serve a 1-year unaccompanied tour. If they elect to participate in the Korea Assignment Incentive Program, their tour is extended by one year, they receive a taxable bonus of $300 per month, but they lose the ability to have assignment preference due to a short tour and lose short tour credit. 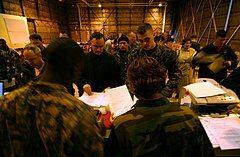 Roughly five percent of the military authorizations at Osan AB are designated as command-sponsored two-year accompanied tours, typically for senior ranking personnel and/or jobs which require a tour of longer than 12 months, due to military necessity. If an individual is placed in one they may bring their families at government expense. Housing on-base, even for command sponsored families, is still limited despite an aggressive family housing construction program. Those authorized to live off-base will receive an overseas housing allowance. There is an elementary school, a middle school, as well as high school for command-sponsored children of military members. Contractors (even command sponsored) should be prepared to pay upwards of $20,000 a year for this privilege. There are many bars and clubs off base and many base members spend much leisure time at them. If the bars do not abide by certain standards, the Osan Military Beverage Control Board may place them off limits to military members. This is usually done when the bar is involved in certain unlawful activities, particularly prostitution. One signature characteristic of many of these bars is the juicy girl. Town Patrol, a section of the 51st Security Forces Squadron, patrols the area immediately outside the base in cooperation with the Korean National Police, to ensure the safety of military members and enforce military law and regulations upon U.S. military members. On July 5, 2012, however, the Town Patrol arouse controversy by handcuffing 3 Pyeongtaek citizens in a dispute over illegal parking nearby the base. After inciting protests from civic groups, three members of the Osan Town Patrol were suspended from their duties, Gen. James D. Thurman, Commander of USFK, made an public apology for the incident. All facilities accept US$ and some accept South Korean won; AAFES BX/Shoppettes and the DECA Commissary are the two notable exceptions that will only accept US Dollars. With the exception of the US Post Office, pennies (1 cent pieces) are not circulated. All transactions are rounded up or down to the nearest nickel when giving change. ↑ Airport information for OSN at Great Circle Mapper. Source: DAFIF (effective Oct. 2006). ↑ "Patriot Express". United States Forces Korea. http://www.usfk.mil/usfk/hot-topic.patriot.express.470. ↑ The United States Army | 3rd BCD-K. 8tharmy.korea.army.mil (2009-04-09). Retrieved on 2013-07-12. ↑ Ham IV, Walter T.. "Battle of Hill 180 remembered on 60th anniversary". USFK General News. Eighth Army Public Affairs. http://www.usfk.mil/usfk/(A(GwMzqRwXzAEkAAAAODM2NDg0N2EtODZjYS00NzgwLWE4MzctNThhNGE1MWMzNWVkTLZou97PY9LKShcF7_woodZpAJM1)S(u2e0xb55yruj5f55w1k0l2rb))/news.battle.of.hill.180.remembered.on.60th.anniversary.printview.748. Retrieved January 30, 2013. ↑ "U.S. to base new unmanned spy plane in Korea". JoongAng Daily. 19 December 2009. http://joongangdaily.joins.com/article/view.asp?aid=2914210. ↑ "Osan incident shows rules for USFK town patrols are not clear-cut". Stars and Stripes. 11 August 2012. http://www.stripes.com/news/pacific/korea/osan-incident-shows-rules-for-usfk-town-patrols-are-not-clear-cut-1.185414. ↑ "U.S. General Apologizes for Dispute in Seoul". The New York Times. 8 July 2012. http://www.nytimes.com/2012/07/09/world/asia/us-commander-apologizes-over-handcuffing-of-koreans.html?_r=0.